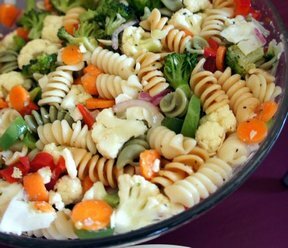 Won't this salad be a beautiful addition to any meal? The colors are wonderful and it is loaded with flavor. Add a little grilled chicken to make this a great summer meal. 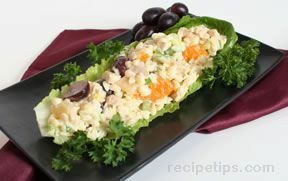 Dressing: In food processor, blend canola oil, garlic, Â½ of feta cheese (4 ounces), and Â½ of prepared cucumbers. Process until smooth, add dill weed, and season with salt and pepper. 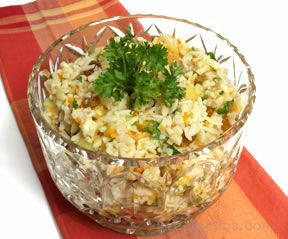 Salad: Cook orzo according to package directions. 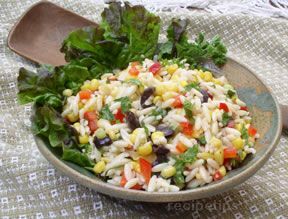 7 minutes before the orzo is cooked, add the frozen corn. Continue cooking an additional 2 minutes. Drain. Place in a large bowl. Add the remaining feta cheese and cucumber. Add roasted red peppers and parsley. Combine well. Stir in dressing. Season with salt and pepper to taste, serve.